Teen Stress: Time to ACT is the Healthy Futures mental health promotion program based on medically accurate material on teen stress, depression, and suicide prevention. These mental health promotion sessions use video content and the peer-to-peer help-seeking model from the award winning, nationally recognized Screening for Mental Health® program designed for middle school students. 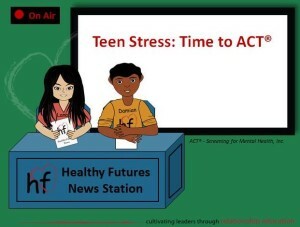 Healthy Futures implements the Teen Stress: Time to ACT lessons over two class periods. These lessons are designed to increase student understanding of common causes of stress, healthy ways to manage stress, that depression is a treatable illness, and how to utilize the peer-to-peer help-seeking model known as ACT® (Acknowledge, Care, Tell). Introduction to Healthy Futures, overview, and ground rules. Class discussion about teen stress, healthy ways to manage stress, and the difference between stress, sadness, and depression. Watch video – Time to ACT®. Class review of Session 1 and Time to ACT®. 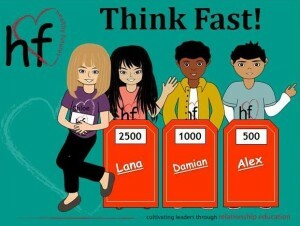 Think Fast! review game to reinforce to reinforce topics discussed in Session 1. Distribute community resources for mental and behavioral health.